Just over 30 minutes of driving from Downtown Vancouver, Sasamat Lake in Belcarra is a popular trout fishing hot spot for anglers of all ages. The fish may not be big, but they are certainly plentiful and can be caught with ease. Access to the lake is easy, as there are main roads to the lake and well built trails that loop around the entire lake if one wants to take a scenic walk. 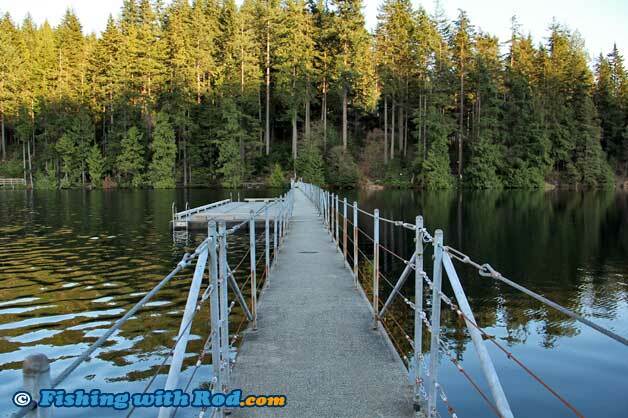 There is also a floating bridge on the south side of the lake. With the above mentioned attributes, it is an ideal place for parents who wish to introduce the basics of fishing to their little ones. Sasamat Lake is located in Belcarra Regional Park. To get there from Vancouver, head to Barnet Highway in Port Moody. From Barnet Highway, turn left onto Heritage Mountain Boulevard. Turn left onto Ioco Road. Continue on Ioco Road until 1st Avenue, make a right turn. Continue up the mountain for around five minutes. Access to the floating bridge can be done from the southwestern corner of the lake via Bedwell Bay Road. The road along the east side of the lake takes you to whitepine beach. Fishing is best during spring and fall. Fish are only found in the deep between November and February. Unless you have a float tube or other floatation devices, shore fishing in the summer months can be difficult because the lake is often crowded with swimmers. Sasamat Lake is stocked several times per year with catchable rainbow trout that range between 10 to 12 inches in length. Fishing can be spectacular once the it is stocked, therefore it is best to plan a trip or two for children who wish to learn right after stocking days. There are many fishing techniques that can be used at Sasamat Lake and no single one method is better than the others. You can spin, jig, float fish, bottom fish, drift fish, flyfish for these trout. All methods will work well, as long as you confident and consistent on what you are doing. When spinning, a simple spinner fitted with a size 4 to 6 hook will work perfectly. To spice up your presentation, you may also slip a small plastic worm or fly onto the hook. Float fishing can be relaxing, but you will need to be attentive to your float. Bait that you use under the float can be deli shrimp, worm, dough, roe, or single Jensen eggs. To be even more simplistic, you can just bait a hook, toss the line in with a split shot clamped above the hook, and slowly retrieve your bait. All of the methods described above can be done from shore or the floating bridge. Fishing from a boat is possible, but launching one can be a tiring task. The shoreline of Sasamat Lake is fairly steep. Although carrying a boat in is not impossible, it is certainly time and energy consuming. A float tube or pontoon boat is a lighter alternative for Sasamat Lake, if you can brave the cold water early or late in the fishing season. Early morning and late evening tend to produce more bites on the surface. During the day, look for surface activities as these rainbow trout have a tendency to travel in schools. You can improve your catches by casting your bait, lure or fly to the nearest school. Sasamat Lake is located in Region 2 in the British Columbia freshwater fishing regulations.